Client Advocate Usually the first person you will talk to when contacting ISCA is one of our client advocates, who, by the way, is a cancer survivor or a person who has been deeply affected by the disease through the diagnosis of a loved one. Our advocates understand the stress associated with navigating the maze and confusion that too often exists when trying to make a treatment decision. We know too, the frustration that can be generated for clients and loved ones alike in dealing with the frequent insensitivity of our present medical system. Whether you or a loved one has experienced an initial diagnosis or are dealing with progressive disease, ISCA advocate is there to listen and take notes on your particular situation to see if there is a potential benefit for you, should you decide you want to pursue our services. ISCA advocate is there for you seven days a week, 24 hours a day to help you through ISCA process and answer your questions. Along with other ISCA professionals, your advocate becomes an important part of your treatment team. In addition to the CTC we have access to a full spectrum of blood tests that may be ordered if it is determined that we need more data regarding your case. We may also require your diagnostic pathologist to forward your surgical tissue samples (contained in formalin blocks only) to one of our Pathologists for comprehensive analysis. The final report will reveal potential therapeutic targets. Other samples might include urine, lavages, or sputum. One of the important components of our services is the compilation and creation of a comprehensive and easier to follow electronic medical record of your case which will then be provided to you in a computer useable format. We will need all pre-diagnostic (6 months prior) and diagnostic records, along with treatment records: this includes reports on all blood analyses, doctors notes, pathology report(s), scanning reports and films, or any other tests or reports pertinent to your case. In some cases it may be necessary for your patient advocate to assist you in obtaining your records. We also want to know about any Complementary/Alternative Medical (CAM) treatments you may have undertaken and we ask that you provide a comprehensive list of the supplements you may be currently taking. This information will be used for analysis by our Naturopathic Physicians who specialize in Oncology and who may be a part of your overall medical team. Once we have received your records we will enter your pertinent medical information into the ISCA Client Detailed Clinical Chronological Review (DCCR) form. 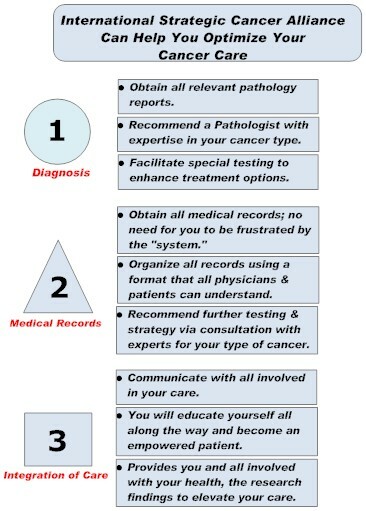 The completed form and a copy of your medical packet, along with the CTC Assay report and a pathology report (if required) will be forwarded to the assigned Oncologist prior to your consultation date. If you are satisfied with the Oncologist you are working with and want to continue working with him or her then we will forward the records to their office. Please read our Privacy statement below, regarding referrals.